This portable machine gives you the power of Galvanic +/-, Micro-current, Ultrasonic, and Light Therapy in the palm of your hand. Save time and Space while up-selling and adding on to your clients services. LED Light Therapy, Blue, Red, Green. Yellow Light: (Wavelength 500+/-3 (18 LEDs) Relieves irritation and aims to enhance the immunity within the skin. It also stimulates the lymphatic and nervous system, to rid the skin of toxins and increase circulation. Blue Light (Wavelength 465+/-3nm (18 LEDs) Kills bacterium from within the skin whilst diminishing inflammation and preventing acne and breakouts. Green Light (Wavelength 525+/-3nm (18 LEDs) Calms and balances the skin tone, this can help to break down and prevent uneven melanin (pigment) production. An excellent treatment that leaves the skin even and bright, whilst calming the skin and stimulating the lymphatic drainage system. Add on to existing treatments such as facial and facial waxing. Create an Add-on for LED or Microcurrent and increase your service ticket. Charge for Extractions and use the Galvanic Negative for desincrustation to make extractions a breeze, finish with positive to balance the PH. Offer a "Lunch-Time Facelift" a short Mini-Facial with Microcurrent. great to introduce clients to your touch or get your 4-5 week clients to be 1-2 week clients. 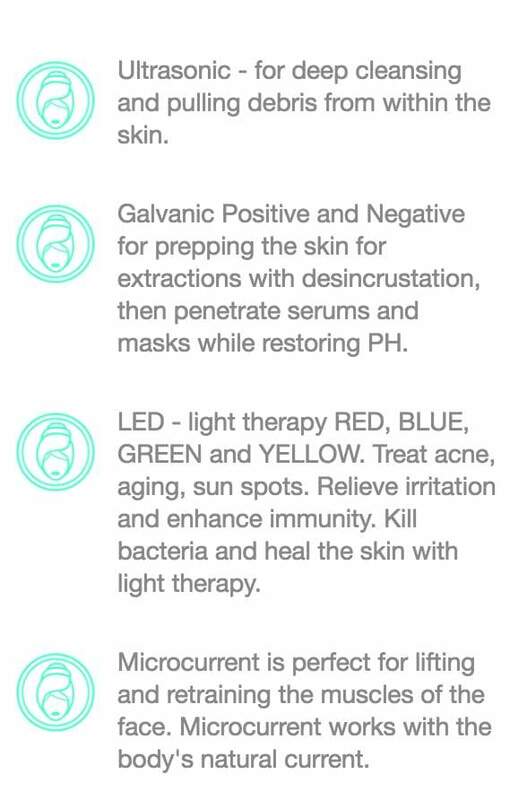 Offer an LED facial that can treat a multitude of Skin Concerns! A "Blue Light Facial" is awesome for Acne clients and will soothe and calm the skin. Create packages and series for facials $150+/- for a series of 3 Microcurrent or LED facials! Create your own treatments! Get as creative as you would like to utilize all modalities. Love it! Came with a little booklet for basic knowledge and prices. Gave some instructions on how to use but if you’re a visual learner there’s lots of YouTube videos. Very simple machine and self times. Love love this hand held!!! My clients see immediate results... Best money I've ever spent!! This tool has been a great addition to my practice. I enjoy being able to offer add on services to my treatments. I would give it a five star rating if there was more information on functions and protocol. As a traveling therapist this product simplifies my day. Very effective on client's skin. Would highly recommend. Love the packaging as well. With Purchasing and shipping I am highly satisfied. Will shop again with Esty Spot. I absolutely love it and my clients are seeing great results! My clients are seeing fantastic results from this LED equipment. I'm very happy with my purchase.